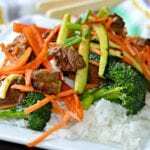 Inside: Find out how to make this delicious beef stir fry recipe, which is loaded with fresh veggies and perfectly seasoned flank steak. 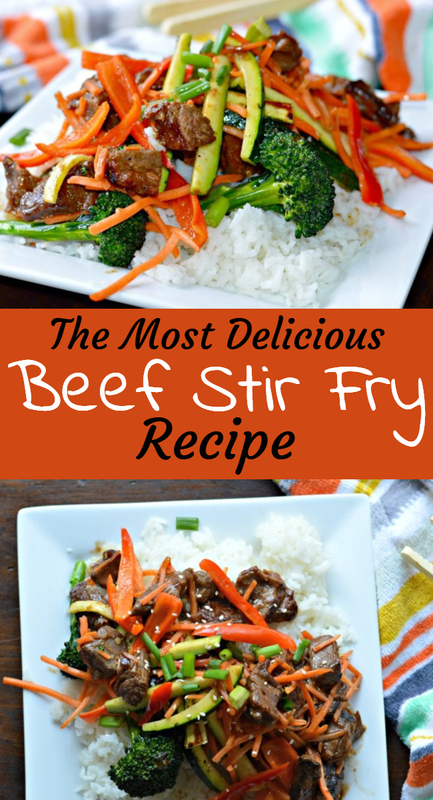 If you are looking for a quick, delicious meal for your family, you will love this beef stir fry. It only takes 20 minutes to make it, and it is a great way to incorporate vegetables into your family’s diet. Stir fry is a Chinese cooking technique where the ingredients are all cooked together with a little bit of oil in a large skillet called a Wok. You can also substitute cooking the vegetables in oil by instead steaming them and adding them to the meat later. 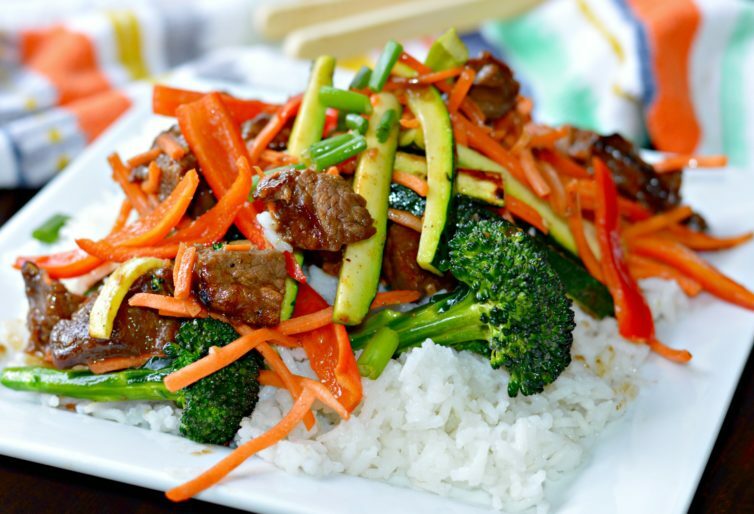 Stir fry is a great choice because it can be very healthy depending on how you prepare it. I usually prefer to replace soy sauce that is commonly used with Coco Aminos. Coco Aminos is a more healthy version which has much less sodium, but which tastes almost identical to soy sauce. 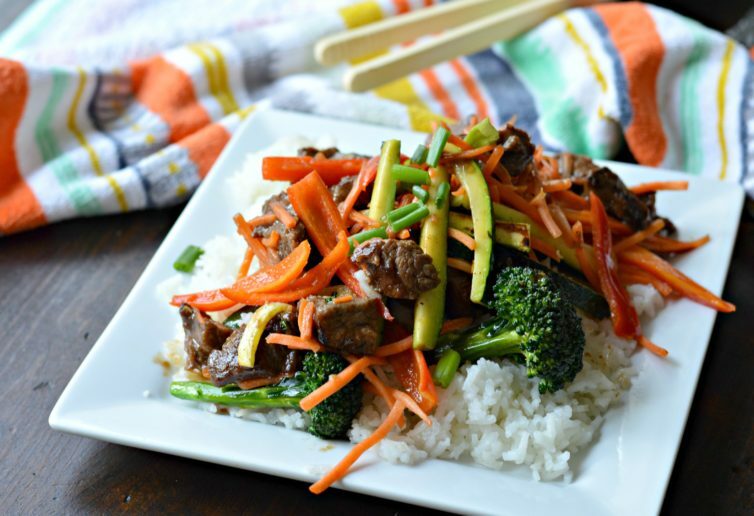 This stir fry recipe has been a mainstay at our house for a long time because it is easy to make and has an amazing sweet and salty flavor profile. Even our kids love it! How do you make Stir Fry? 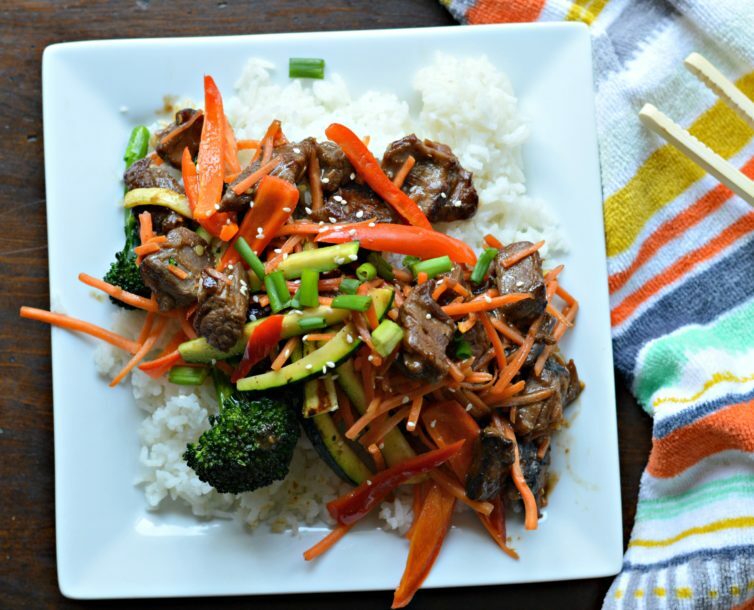 Stir fry is one of the easiest and quickest meals that you can make. There isn’t any special trick or science to it, and it will be an instant hit. The great thing about this recipe is that you can make it with whatever type of meat you prefer. For example, you can make it with chicken, beef, or pork. On the other hand, if you are a vegetarian, you can omit the meat altogether! All you have to do to make this recipe is to combine a variety of fresh vegetables with your favorite type of meat (flank steak in this case). Once you combine them, you just cook them together in a large skillet with a variety of spices, moving them around until everything is cooked. The final step is adding a soy sauce or coco aminos based sauce, ginger, and even red pepper flakes if you like it spicy. My personal favorite way to eat stir fry is with a plate of white rice. That said, my husband loves it with noodles and I have to say it is pretty great that way too! You can easily incorporate this recipe into your weekly meal plan. I used to love to buy food like this at restaurants and bring it home to eat while watching our favorite shows after putting the kids to bed. However, one day, I decided to make it myself and I realized how fast and easy it was. Not only did that save us some money, but it also tastes better homemade. Another good thing about this recipe is that you can eat it warm or cold, and it will last in your refrigerator for a few days after making it. Don’t forget to try this recipe and let me know below how it turns out! 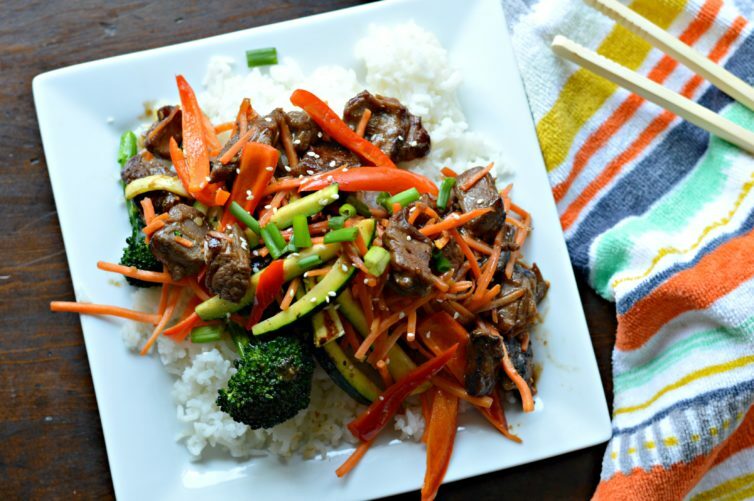 Find out how to make this delicious beef stir fry recipe, which is loaded with fresh veggies and perfectly seasoned flank steak. Combine the corn starch with the beef stock and mix until no lumps remain. Add the rest of the ingredients and stir well. Set aside. Season the meat with salt, pepper, cumin, and garlic powder to taste. Cook the meat in 1 tablespoon of sesame seed oil until it is browned on all sides. Set aside. In the same skillet where you cooked the meat, add another tablespoon of sesame seed oil and cook the vegetables for about 3 minutes. Add the meat back to the vegetables and add the sauce from above. Cook for two minutes and serve immediately over rice or noodles. To prevent the veggies from being soggy, make sure that they are completely dry when you start cooking them. Also, make sure only to cook for about 3 minutes before adding the meat back in.